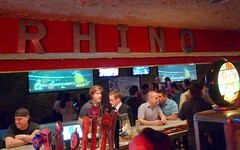 Fritz at GOG pointed out that Luke’s Wings will be hosting a happy hour tonight at Rhino Bar in Georgetown, with proceeds ($10 via Luke’s Wings or $15 at the door) going to Luke’s Wings to help get the families of those injured in the attack to visit their loved ones in the hospital and during their recovery. The cause is worthy, and the cost is small. Pay tribute, and buy a soldier a beer while you’re there.